Congratulations to Mary C, the winner of Cindy's giveaway. Thank you to all who participated. Television Host: Thank you audience for tuning in. I have an exclusive interview with ‘The Lukas Bucklin’, a multi-billionaire with a take charge attitude. He has secrets, let’s see if we can get him to expose them! Host: Mr. Bucklin, you look nervous. This interview is very informal and I’ll start out with an easy question. What’s your favorite food? Lukas: What kind of question is that? I can afford any delicacy I want, delivered whenever I want. Caviar, lobster, you name it! Host: Okay, so my attempt to ease into the interview back fired, I’ll get down to business and ask my next question. Who was your first girlfriend and how old were you when you met? Lukas: I was seventeen when I met the love of my life and she is the mother of my son. I’ll leave it up to you figure out who I mean. You’ll have to read it in Desperate Measures, the novel in which that damn author, Cindy something or other, chose to write my life story. Host: You don’t want to talk about that book do you, so I’ll ask about your career. How long have you worked at your current job? Lukas: Job? I don’t have a menial job! I’m the CEO and Chairman of the Board of my own company. I built an empire. Host: What’s your greatest pet peeve with you Mother/Father? Why? Lukas: My father was ruthless but a peon. Oh, he may have started a gourmet grocery store but I turned it into a national chain. That move on my part started the foundation on which I built Bucklin Enterprises. Lukas slams his fist on the table. Host: Lukas, if you could meet anyone living or dead who would it be and why? Lukas: HA! What kind of question is that? Anyone in their right mind would love to meet me. Didn’t you read what I did to protect…, Oh, well never mind that, you can read the story in Desperate Measures but I am a force to be reckoned with, let me tell you that! Host: Who’s your favorite artist, singer, etc.? The secret is out AGAIN…! This time lives are in jeopardy. When Tomas arrives, his status is quickly upgraded and the investigation becomes official. The third threat creates a direct link to multi-billionaire Lukas Bucklin. The suspense escalates through twists, turns, and family secrets yet to be revealed. A powerful climax unveils an unlikely alliance between two deadly and dangerous enemies. 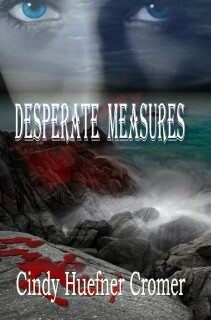 Cindy will be awarding one lucky commenter with a copy of DESPERATE MEASURES! Giveaway ends 9pm EST April 14th. Please supply your email in the post. You may use spaces or full text for security. (ex. jsmith at gmail dot com) If you do not wish to supply your email, or have trouble posting, please email justromanticsuspense @ gmail.com with a subject title of JRS GIVEAWAY to be entered in the current giveaway. Okay, this sounds interesting. Haven't read anything by Ms. Cromer, bit will Definately check her out. Romantic suspense is my favorite genre. Thank you for your comment. This is my first novel but I'm finishing up my second, Desperate Deceptions. Your "Desperate Measures" really caught my eye. The cover is great. Also the storyline sounds intriguing. Please enter me in the draw. Thank you! I had some input in the cover but not much. However the rocks on the front are from The Black Rocks in St. Kitts. Thank you! In addition to creating the character of Lukas, writing this interview about him was a lot of fun. Wait until you read what he is up to in my second book, Desperate Deceptions(not yet released). Wow Lukas is interesting... is he like that throughout the book? Thanks for the introduction to the book and Lukas. I am unfamiliar with Cindy Huefner Cromer... looks like another author I need to look into reading! Thanks for the comment. Oh yes Lukas is like this throughout the book and then some. This is my first novel and I'm finishing up my second, Desperate Deceptions. Lukas is up to his tricks in this one too. After Desperate Deceptions is released I'm going to give Lukas a bit of a rest and finish the NFL and medical thrillers I have drafted. So much mystery in Caitlin's past. I hope Scott, her husband will still be her champion in the end. I love the intensity of the excerpt. Need to know the ending of the story. Definitely a must read for me. Yes Caitlin does have a mysterious past doesn't she? My second book, Desperate Deceptions, also features Lukas, Caitlin, and of course secrets, secrets, and more secrets. Very nice interview. The book sounds very good. Your comment is a dream come true to an author, especially a new one like me. LOL! Love the blurb for Desperate Measures and after reading the interview, I have a need to learn more about Lukas Bucklin! Thank you Mary! I have been informed that you are the lucky winner, congrats!! I will e-mail you shortly. Loved this excerpt. Now I have to get this book! Thank you for your wonderful comments. I am so, so, very sorry I was not able to respond earlier. I had to leave town unexpectedly for a funeral. I thought I'd be able to log on here and there. Again, please accept my appologies and I'm thrilled each of you enjoyed the interview.